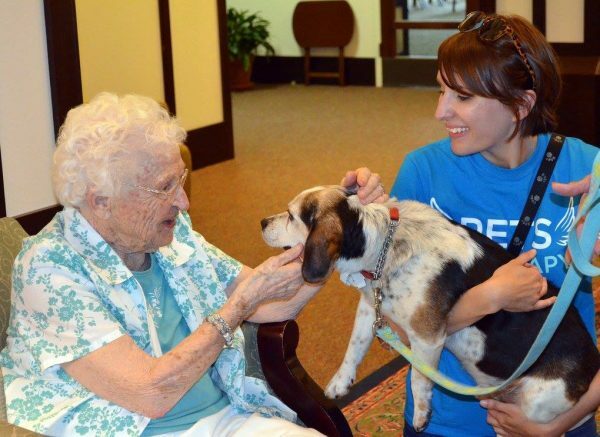 We are proud to partner with Visiting Angels to bring pets to nursing homes, assisted and independent living facilities in Lorain and Cuyahoga County. Studies have shown that when seniors interact with animals – lower blood pressure and lower reports of loneliness are reported – and there are huge benefits to the increased social interaction and physical activity. Studies even suggest an increased capability for learning and retaining new information. Allowing seniors the opportunity for companionship, if even for a few hours, creates a compassionate interaction for two of our society’s most overlooked groups. We also offer fee waived adoptions on seniors cats for senior citizens.